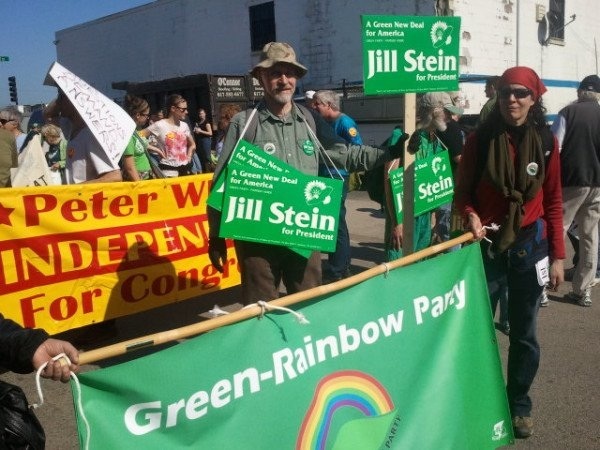 Members representing the Green-Rainbow Party marched in the St. Patrick's Peace Parade in Boston on March 18. We were the only political party to join the peace parade. The GRP banner led the way followed by marchers, some holding "Jill Stein for President" signs. The weather was great and we were received very warmly by the on lookers. Among the GRP members who showed up to march were John Andrews, Anthony Barrows, Danny Factor, Shirley Kressel, Saul Levine, Wes Nickerson, David Rohrlich, and Claribel Santiago. Mulltiple people came up during the course of the parade and offered to help carry signs! Cutest dog: The dachshund wearing the tam-o-shanter hat. Best T-shirt: The 6-foot tall guy with a T-shirt that read "World's Tallest Leprechaun"
Best license plate: Car from New Hampshire with license "IMLOST2"
The MBTA decided to close the Broadway subway station which made it difficult for people to get to the parade assembly point. Traffic was also bad. The start of the parade was delayed by almost two hours because the police refused to let the peace parade step off on time. Among the other groups participating in the peace parade were church groups, peace groups, GBLT groups, unions, occupy groups, Peter White for Congress. The principal organizer was Veterans for Peace. We thank all our members who showed up to march with us!